Life the past few weeks has been hard. We packed up everything at the start of the month and moved to Michigan for a great opportunity. The benefits of the job don’t diminish the sadness over leaving all our friends behind, but we are starting to settle in a little bit. 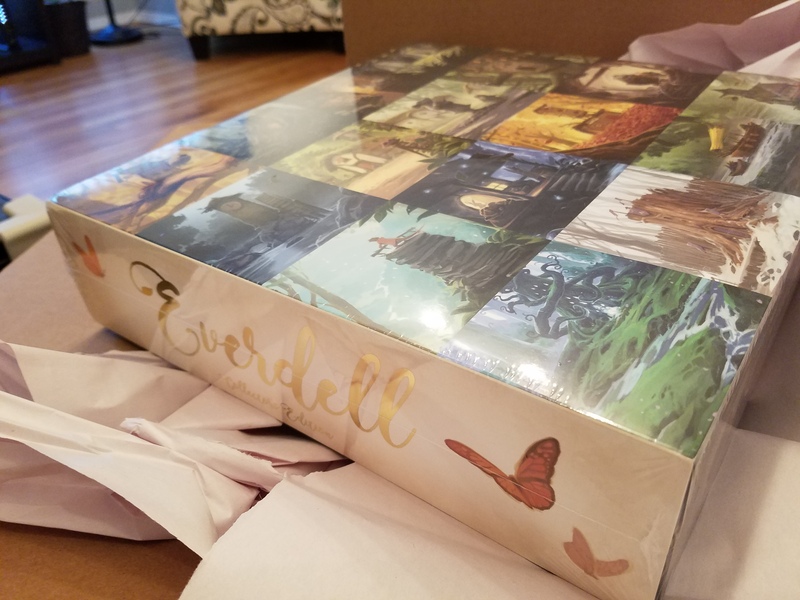 After all the things that went wrong and the stress of the move, imagine my surprise when I got an email from Starling Games stating that they were fulfilling their Kickstarter for Everdell almost 5 months early! So, naturally, I frantically tried to change the address so that it would come directly to us at our new address to no avail. Luckily, I knew the move was coming in time to give them my parents address and they forwarded the package to me and it arrived today! 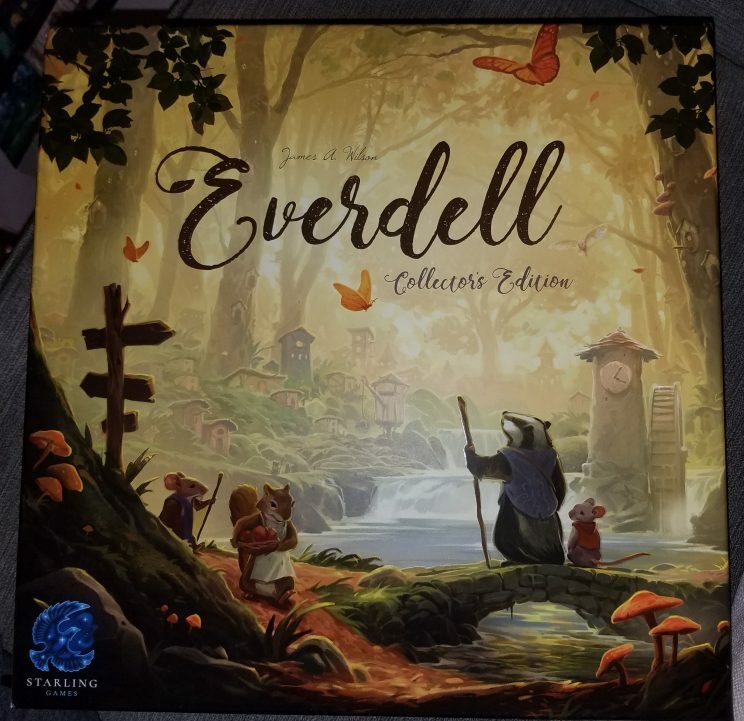 I haven’t had a chance to play a game yet, but I am excited about this game, so I wanted to share some initial thoughts on the contents of the box and the quality of the components. You can see the gold foil lettering on the side, but there are no obvious indicators on the top (or bottom) of what game it is. I think I like the regular box better, personally. I’ve never backed a Kickstarter project before, so I didn’t really know what to expect. 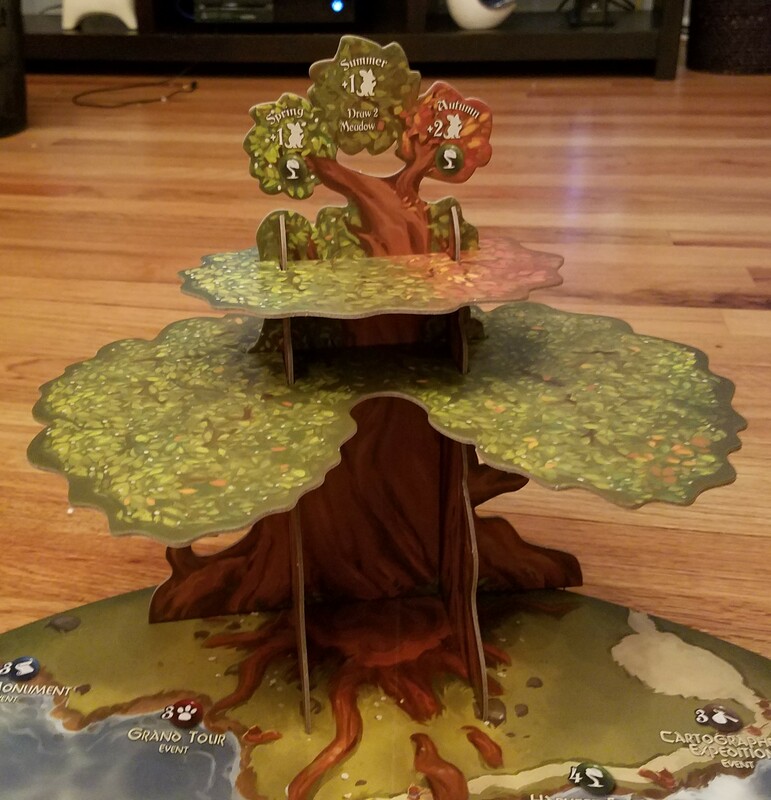 I’m a fan of worker placement games, and Starling Games had posted a full set of the preliminary rules with the project, so I decided to jump on board. And for just $9 extra, I upgraded to the collector’s edition, because why not? I’m not a big fan of slip cases, but the collector’s edition came with a gold foil one. It’s pretty, but I’m sure I’ll give up putting it back on after every game. I don’t need any barriers to getting into my games, thank you very much! I’m a big fan of the art style used in this game. The box itself has a selective UV coating on it, meaning that certain parts are matte and others are glossy. It’s a really cool effect that is used to good effect to draw the eye from the background (matte) to the foreground and lettering (glossy). It’s a solid box with a decent vacuum-formed custom insert, but it’s not as spectacular or specific as games like Abyss or Dice Forge. All-in-all, it’s a serviceable box that lets you store the components snug so they won’t rattle around. There are a fair amount of components in the box. Punching the tree out felt a bit dangerous. 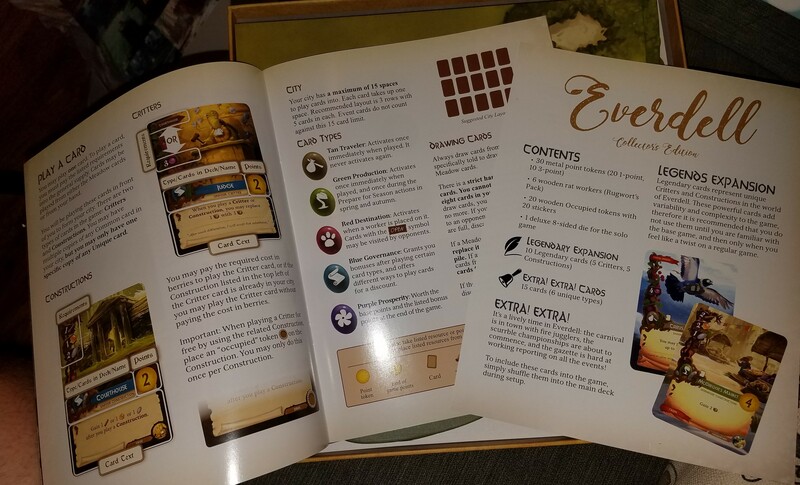 The Kickstarter reached all the stretch goals, which means that the regular edition gets the same upgraded resource components as the collectors edition. Instead of brown, purple, orange, and grey tokens, we get wooden sticks, purple berries, orange resin, and grey pebbles that look like the resources they represent. 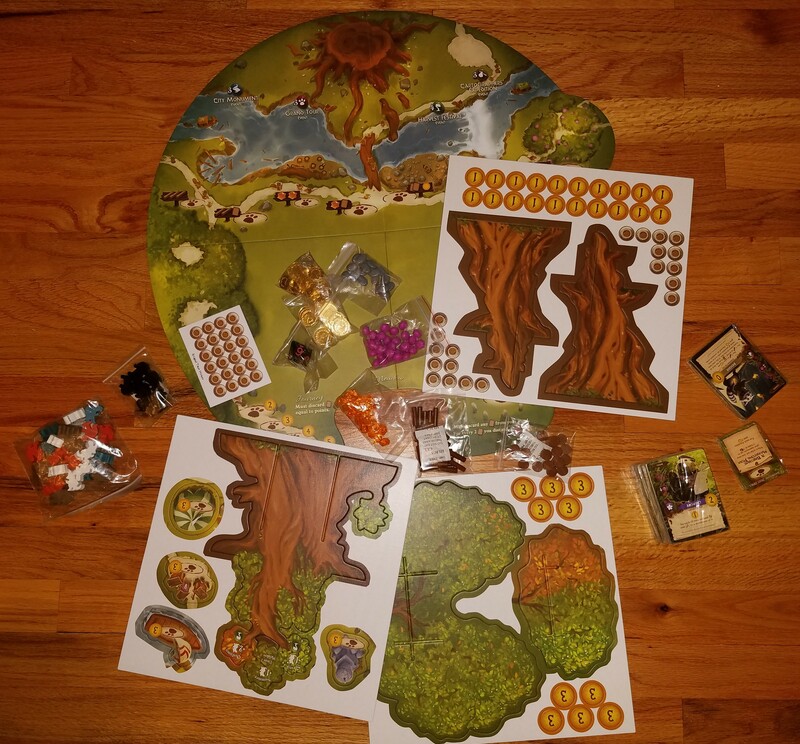 The regular edition does not get the wooden occupied building tokens or the metal coins, as far as I know, but the collector’s edition also comes with the cardboard versions of those components as well. The metal coins are solid and are probably the heaviest board game coins I have ever held. The wooden occupied building tokens come with a sticker sheet to be added. Build quality seems pretty good, except the wooden sticks are round, so they roll. The board is matte finish and a really cool shape. It’s brand new, so it doesn’t lay flat the way games that have been played a thousand times do, but I’m hoping that will resolve itself with play. The cards have a nice finish on them and there are a lot of them with different frequency for different cards. This should add some variability to replay, but I’ll have better thoughts on that soon. I’m not sure how well they shuffle yet, either. The card deck fits into the notch in the tree. Special event cards are placed on the lowest branches, and the player tokens are placed at the top to be retrieved after each season. The player tokens are a lot of fun. They’re cut into hedgehogs, turtles, bunnies, squirrels, and rats, each with their own player color. The cut and quality is good and consistent. The tree looks great, but feels a little flimsy during set up. I’m concerned that constant use may result in warping or bending. I will let you know how it holds up after a few playthroughs. The rulebooks are full of art and lore. The rulebook includes the rules for competitive and solo play in what I find to be an easy to understand manner. The rules haven’t changed since the Kickstarter, other than to convey them better. The rules are easy to follow, but I suspect the card variety will slow down the first few games until people learn what their options are. In the end, I feel like I got my money’s worth in terms of game components and build quality. As to whether the game is good? That will have to wait for a play-through. I hope to get a few solo runs in this week and maybe get it tabled with some locals next week.